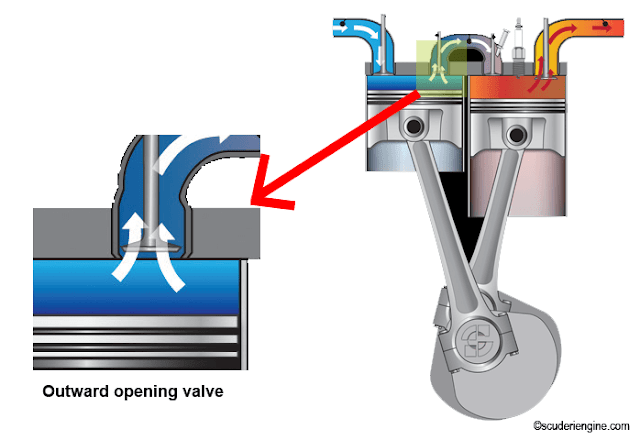 The breathing problem in compression design is solved by reducing the clearance between the cylinder and piston head less than 1mm by unique valve design. In this design the valves open outwardly that enables the piston to move very close to top dead center (TDC) without the interference of valves. This effectively pushes 100% of the air into crossover passage. Then eliminate poor breathing problem. 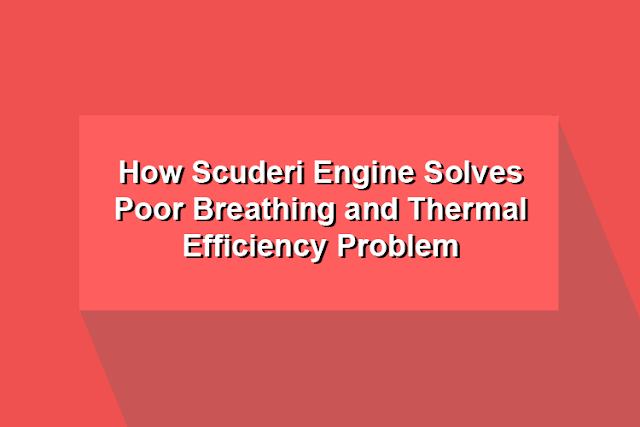 In conventional engine fuel fire before TDC, in Scuderi engine fuel fired after TDC. This unique thermodynamics enables to Scuderi to reach new levels of efficiency and power. Firing after TDC in this engine eliminates the losses created by the recompressing of gas. Firing at TDC is accomplished by using a combination of high-pressure air in the transfer passage and high turbulence in the power cylinder. Because the compression and power cylinder are independent of each other, a higher compression ratio can be achieved in compression cylinder. The pressure inside compression cylinder and crossover passage reach more than 50 bars in the naturally aspirated engine and 130 bars on a turbocharged engine. This high pressure in causes turbulence as it enters to power cylinder. The result is the rapid atomization of the air-fuel mixture, promote stable combustion. High-speed flame helps to avoid pre-detonation. This high turbulence also contributes to keeping the valves open as long as possible during combustion.